The brief was to redesign an old HTML website, bringing it up to speed with optimised mobile and SEO friendliness. The company is a successful and well established driveway design firm. 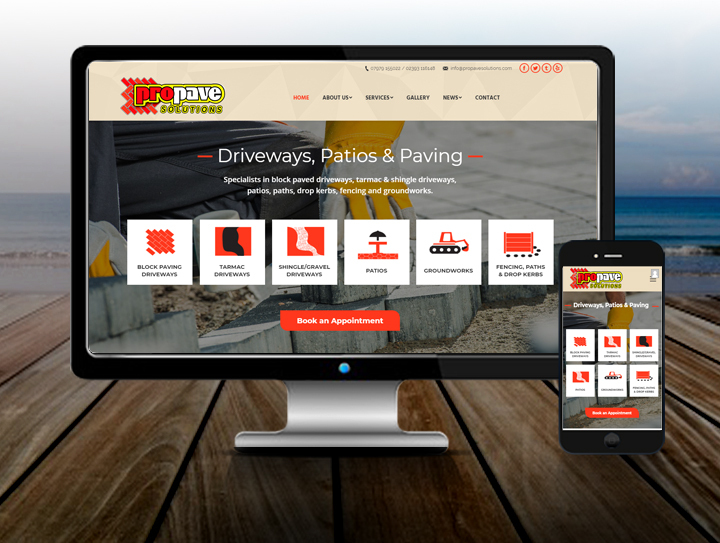 They provide a full service to design, excavate and build driveways. They specialize in block paving, but also cater for shingle and tarmac drives. The Manager is a current customer, as we had previously designed websites for his two other companies for Plans 2 Completion Ltd and Trade Labour Services Ltd.
My client wanted to be noticed on Google, so we designed the site with seo in mind from the outset. All the services pages were produced and copywriting all the text adhering to Google guidelines and seo scoring was essential for this project. A keyword campaign was researched, thus forming a concrete SEO strategy. Within this project design, bespoke icons were designed, and we chose a flexible WordPress layout for the best mobile and tablet views and created blogs for Google news, Tumblr and a special knowledge base page. The strategy for good organic SEO was developed throughout the build of the website.